If I had a dollar for every time my phone rings and the person on the other line is an author or a filmmaker or an out-of-town journalist who has discovered the mountaintop removal story and is sure they have found something new about it … well, if I had that cash, you all wouldn’t have this blogger to kick around anymore. I’m ashamed to admit that I long ago stopped trying to read every magazine piece or book or sit down and closely watch every documentary on the subject. Despite the claims by some that the media ignores the issue, mountaintop removal has gotten wide, deep and consistent attention, with that coverage only growing in recent years. But I did sit down last night and watch a DVD review copy of “The Last Mountain.” I even made my wife watch with me. The film is getting so much attention that I wanted to check it out. And yes, I wanted to see if the long interview I did with an earlier set of the project’s filmmakers had somehow survived getting tossed on the cutting room floor. I can’t even remember for sure when the interview was, but I think at least five years ago. They were most interested in talking to me about the stories I did revealing that the new coal silos at Massey Energy’s Goals Coal facility were actually outside the mapped permit area adjacent to Marsh Fork Elementary School. Those stories came out in 2005, and one thing that struck me in watching the film was how much has happened in the six years since the site of Raleigh County grandfather Ed Wily, protesting the school’s location downstream from a Massey impoundment and adjacent to the company’s processing plant convinced me to detour over to the WVDEP office’s file room and take a look at the old maps on the site. — Joe Lovett and his growing staff of lawyers at the Appalachian Center for the Economy and the Environment have filed more lawsuits and won more court victories, with help from the Sierra Club, Earthjustice and Public Justice. — Activists working against mountaintop removal have hunkered down for a long peaceful civil disobedience campaign, launching direct action protests to literally put their bodies between the mining machines and the mountains. Anti-mountaintop removal Bo Webb. Photo by Antrim Caskey. — President Obama was elected, taking office in January 2009, and giving the U.S. EPA new ability to try to curb the damaging impacts of mountaintop removal, with tougher permit reviews and a veto of the largest mountaintop removal permit ever in West Virginia history. — Coal industry officials and their friends among Appalachia’s political leaders have fought back, calling the Obama moves a “war on coal,” and crafting new public relations campaigns aimed at blocking any tougher rules on mining or coal’s air pollution impacts. Maria Gunnoe. Photo by Vivian Stockman. The film walks us through much of this recent history pretty clearly. It also includes fine portraits of some of the local residents who have given so much of themselves to trying to have these issues addressed. It’s easy to forget how compelling the stories of folks like Bo Webb and Maria Gunnoe really are until you see their narratives as relayed by outside storytellers. And gosh, this film has just incredible aerial footage and some of the best close-up views of a dragline operating that I’ve ever seen. Also, the interviews with some of the young folks taking part in the protests against mountaintop removal were fascinating, not for their expertise in coal issues, but for their thoughtful explanations of the power of peaceful civil disobedience as a tool for social change. 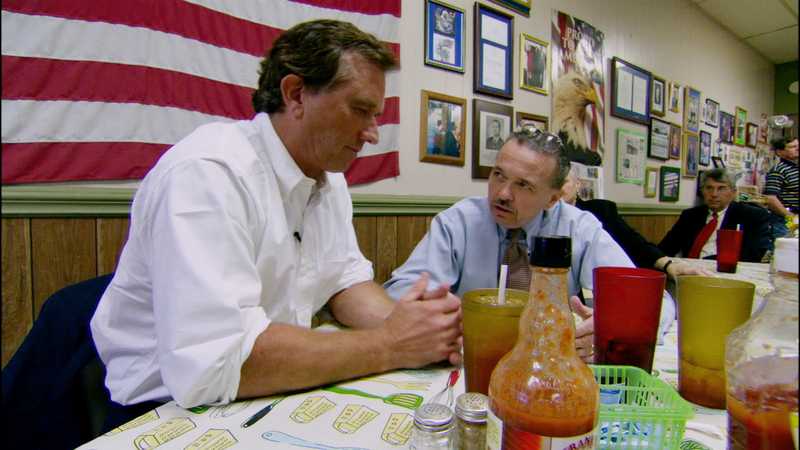 At times, the film seems strained in its effort to tell the mountaintop removal story as one centered around the efforts of Robert F. Kennedy to bring the issue to a broader audience and help local activists here succeed in their fight. Some of the events appeared — perhaps because they were — staged to get footage for the film. Probably my favorite parts were the mini-lectures from Bobby Kennedy about the law of the commons, and how historically things like clean air and fresh water were the property of all the people. Kennedy was especially good when he talked about Robin Hood, and the king trying to stop poor peasants from being able to hunt deer to feed themselves. Like most people, Kennedy is at his best when talking about his own experience, and he clearly feels strongly about how our natural resources should be part of the commons. This is all a view that West Virginia political leaders certainly don’t talk much about in their endless effort to promote themselves as supporting whatever the coal industry wants. The strength of the film is that it’s told through Kennedy’s view point, which is obviously built on a very different life experience from most of us here in West Virginia. But, as Kennedy did in his debate a year ago with then-Massey CEO Don Blankenship, the film stumbles a few times on inconvenient facts that get in the way of the narrative or a point they’re trying to make. For example, the film makes out like changing the Clean Water Act definition of “waste material” to help out coal companies was entirely a creature of the George W. Bush administration. In fact, that particular rule change began and was first formally proposed by the Clinton administration in April 2000. And, as best I could tell, the film was continuing the use of the bogus comparison between industry-wide jobs for wind power and miners-only jobs for the coal industry. And nothing against Allen Hershkowitz, but personally, I would have liked to see the science in the movie coming from someone like Margaret Palmer or Greg Pond or Michael Hendryx, rather than someone from inside the NRDC, the group Kennedy works with. But hey, it’s his movie. In the end, this is a powerful film, and it’s important for folks in West Virginia to watch — because a lot of people outside of our state will watch it. We should understand how the rest of the country views us, and how that conflicts with how we view ourselves. And we should understand what the rest of the country thinks of what’s happening here with mountaintop removal, whether we think they’re right or not. Perhaps that’s why one thing that actually really troubled me about the film was the scenes with my buddy Bill Raney, president of the West Virginia Coal Association. It’s hard to feel sorry for Bill, but who can really take on Kennedy in a one-on-one discussion that was set up to be filmed for Kennedy’s movie? Not many people. But those scenes were about the only voice in the movie for people who continue to rely on mountaintop removal for their jobs, except for a few pretty limiting sequences where Kennedy tries to talk with pro-coal protesters who showed up for a big rally outside the WVDEP offices here in Charleston. “Talking Dirt” offers an empathetic twist to its otherwise gloomy view of strip mining. While Beth, who has been offered a scholarship, opposes strip mining, Roger, a young miner, shows her that her privileged status gives her the luxury to choose. “There wasn’t anybody standing there offering me a scholarship when I graduated high school,” he tells her. It’s becoming more and more clear that the rest of the country — especially power brokers in places like Washington, D.C., and New York — understand the damage that mountaintop removal does to our region’s environment and communities. That’s important. But do they understand fully where all this coal is going? And more importantly, do they really understand the economic trap that young people find themselves in across the coalfields? I’m not talking about the “war old coal” rhetoric that says if you try to more fully regulate coal’s impacts the sky will come falling down. I’m talking about the situations that young folks like Roger and Beth confront every day. Figuring out how to give them more options is the huge task that really confronts this region, whether you ban mountaintop removal or not. 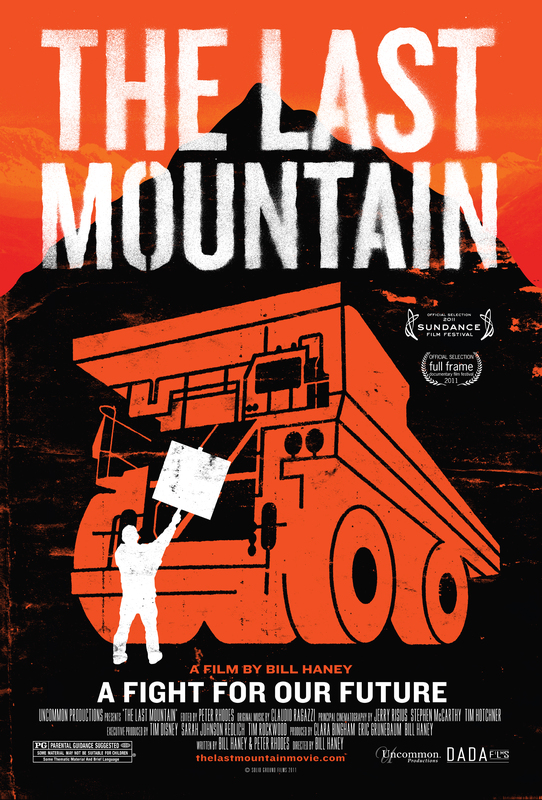 In its defense, “The Last Mountain“ includes a lengthy examination of the proposals to turn Coal River Mountain into a wind farm, instead of a mountaintop removal site. But I wondered as I watched it if Paul Krugman would have cringed at how easy the film made it sound to transition the coalfields into the home of clean energy production. There’s a free showing of The Last Mountain Friday night at 6:30 at the West Virginia State University Capitol Center Theater on Summers Street here in Charleston. There’s limited seating and it’s first come, first served. Other dates and locations around the country are available here. Thanks for the awesome review of the movie, and reminding readers outside of your neck of the woods that this is not some newly discovered problem. In my central Texas neighborhood, people are talking about the documentary, too, and groups of students, stewards of the land, and the religious community are organizing trips to see it when it comes to town in mid-July. I thought you and your readers would like to know that people who have never even seen in person the beauty of Appalachian mountains and its people, want to learn more about how our huge appetite for energy is destroying a way of life and the good Lord’s handiwork. Eric Grunebaum- and have known Bill Haney since they were Freshmen at a local college. I am very proud of what these young(ish) people are doing. The letter and blog made me realize that the movie can get a lot of exposure, that it’s accessible, and can help other folks in similar situations feel support and hope that grass roots organizing can be effective. Your buddy Bill Raney? I repeat, your buddy Bill Raney? Will you validate this? Because if you are serious, you have damaged everything you have have written until now. Why should you be taken seriously from now on? The economic tragedies for the young people are heart-breaking. Poverty in the coalfield counties is the worst in the state. Those depending on coal mining for their livelihood and that of their children are going to be increasing boxed in. Coal jobs and wages are in an inexorable decline, and those decision-makers who should know, and who could lead the way to new occupational opportunities, fiddle while Rome burns. It is an utter pity. Our elected “leaders” see more benefit in pitting us against each other than discharging their moral obligation to help their fellow citizens. Because someone needs a job does not mean that he or she has the right to destroy our land and poison people. Very few MTR workers blow up their own back yards. They come from Beckley or Lewisburg or Pikeville or Charleston or Logan, not from the hollows that are being filled and flooded. Also, if you are really worried about job loss, why don’t you mention the transition from deep mining to 45% mtr? This really sprung the “economic trap” for thousands. You obviously don’t read Coal Tattoo very often, and that’s fine. In any event, though, I will say that — contrary to some folks in both the coal industry and the environmental/citizen group community — Bill Raney has never, ever been anything but a gentleman to me. Regardless of what I write or whether he agrees or disagrees with it, he returns calls, patiently answers questions and is very helpful in convincing others in his industry to talk to me and provide information that furthers my efforts to report on these issues. You’re welcome to take seriously or not take seriously anything I write. As I’ve told you many times, I have tremendous respect for you and your work, and there’s no question your writing has provided a vital voice to issues in Southern West Virginia. I don’t feel the need to defend myself or my work — my body of journalism speaks for itself — but I did want to explain my use of the phrase “my buddy” when referring to my buddy Bill Raney. Jim hits it right on the head … these are heartbreaking stories. I’m reminded of the young man who drove up from Kentucky for the Spruce Mine hearing, and said that he didn’t and couldn’t imagine any option for him except coal mining … Now, coal mining is an honorable job, a good day’s work, and certainly a job our society needs people to do. But the idea that a young person would think they had only ONE OPTION in life … well, that is pretty depressing, isn’t it? And Brad, it’s easy to just criticize someone else and their choices because you disagree with the results. It’s tougher to do as Jim did — and try to understand the person and where they’re coming from. That’s one of the biggest challenges we face here in Appalachia, but the more that everyone tries to not just spout off what they think and listen to what the other side thinks, the better off we’ll all be. I agree with Ken’s response to Denise. If you start to de-humanize someone you don’t agree with, then there is no platform to ever talk and discuss issues and one can be blinded to the other side of the issue. One may not agree with how someone stands on an issue or what they do for a living, but that doesn’t mean that we can’t be cordial, professional, and civil to each other. And it doesn’t mean that one could even have some social contact with eath other. I doubt that Ken and Bill Raney are going on family vacations together, but they certainly could end up dining together and have a few drinks at the pub. Ken thanks for the honest review of the movie for what it was. It’s sad when calling someone across the isle a friend brings so much ire. Wonderful review. Each generation finds this issue anew. I remember as a kid seeing Bill Strode’s photo of the Widow Combs being hauled off her property by the state police. She had stood in front of the dozers that were ready to strip her land. That was in 1965. This was an even better reminder that there are people in those mountains everyone is trying to save who need to be remembered, too. And, finally, the exchange above is a lesson in the importance of civility. Thanks for all of the above. There are several variations to the way Appalachian is pronounced. As if the varying boundaries weren’t enough, there is no fundamental agreement even about how to pronounce the word “Appalachia.” Residents of southern and central Appalachia pronounce the term with a short -a- in the stressed third syllable; further north, the same -a- is given a long pronunciation, as in “Appal-achia.” Most of the experts and bureaucrats who came from Washington and elsewhere to fix the region’s problems beginning in the 1960s adopted the northern pronunciation, while resident experts favor the southern– which led to a situation, according to one commentator, wherein “people who said AppaLAYchia were perceived as outsiders who didn’t know what they were talking about but were more than willing to tell people from the mountains what to do and how they should do it.” Finally, while a majority of both long and short -a- users crunch the third syllable as though it were spelled Appal-atch-yuh, in New England– where the term “Appalachian” first came into widespread use by nongeologists thanks to the Appalachian Mountain Club and the development of the Appalachian Trail– a variant pronunciation uses “sh” rather than “ch,” as in Appal-ay-shuh. I was raised mostly in Western Penna., and my Dad had a dream of hiking the “Appalaychian” Trail, which was the customary pronunciation there, and as far as I can recall, in places like Maine through Pa — which has a lot of the Trail. I’m proud of my Dad and my roots and I always say it like he did. I wonder if anyone ever explained to the Widow Coombs that her actions were insensitive to the plight of the bulldozer driver, who was only doing his job to put food on the table for his family? That comparison is off base, and takes what I wrote out of context. I wasn’t suggesting, for example, that Bo Webb should develop a better understanding of the life of the guys who work on the strip job above his homeplace. (In fact, Bo probably does understand those guys, probably far better than I do). As you know, Vernon, many folks who oppose mountaintop removal have coal miners (even strip miners) in their immediate families, and they understand all too well the pressures and the lack of economic choices people in those communities face. “It’s becoming more and more clear that the rest of the country — especially power brokers in places like Washington, D.C., and New York — understand the damage that mountaintop removal does to our region’s environment and communities. My point, perhaps not made as clearly as I would have liked, was that the outside world sees and understands the damage mountaintop removal is doing to communities and the environment here. 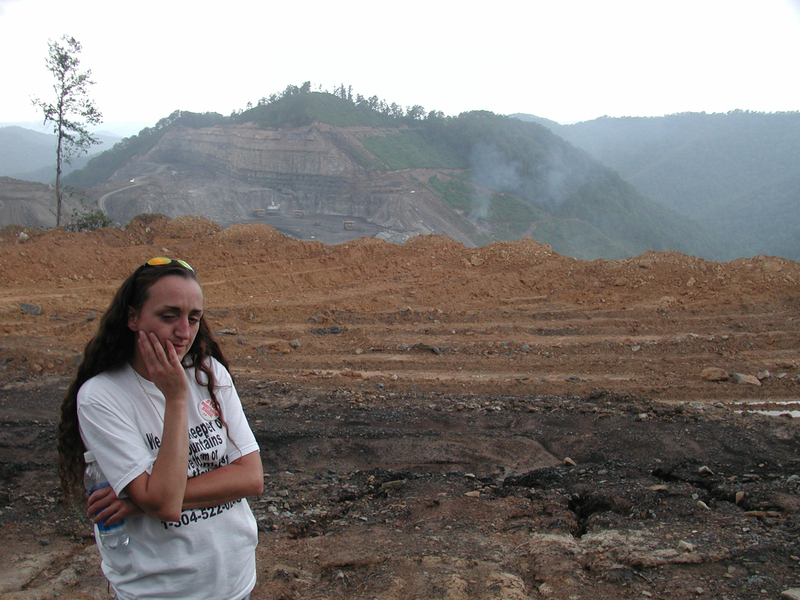 They see what drives people like Bo to oppose mountaintop removal. I’m not sure the rest of the country understands completely its own role in allowing this practice, by cherishing cheap power and cheap steel. And I’m not sure they truly grasp the lack of opportunities for young people in these communities — and I don’t think anyone can possibly argue that the rest of the country has done much of anything to provide different opportunities for those young people, so they won’t feel trapped into a mono-economy. From everything I’ve heard from Bo Webb or from Maria Gunnoe, they are far from insensitive to the need to find other types of jobs — but the point I was trying to make is that I’m not sure the folks from around the country who also want to end mountaintop removal fully grasp the local economic and political movements that are on the other side of the fight. Let me apologize to Ken. I was off base to question your reporting; I do respect it. I still would point out that “civil” and “coal” are two incompatible words, an oxymoron. Perhaps you have to grow up in a coal camp to understand that. For another suggestion of how to address a coal operator, check out the most recent status discussion on my Facebook page. Her in SW Pennsylvania, it is pronounced exactly as Ken described. The “Apple-at-chan” pronunciation seem to be associated with the bitumunous coal regions plus the southern parts of the Blue Ridge, Ridge and valley, and Smokies – mostly settled by the people of Ulster-Scot (“Scotch-Irish”) from which the “Apple-at-chans” colorful musical traditions originated, now in decline. Rest in peace, Hazel Dickens – is any of her singing in the movie? Interesting review by my buddy Ken. I can only say that, as someone who works with plenty of people who grew up in coal camps, they are some of the most civil people I know yet they also are ardent supporters of coal. Now, they don’t think much of the operators, sometimes, but they are civil coal miners. Not an oxymoron. Hi Ken, my Widow Coombs comparison was not directed at your comments as much as at the folks who’ve said, “You shouldn’t make any effort to end MTR until you’ve provided jobs for the people doing it.” If I had billions of dollars and control of the state’s government, I would. There are people who do have those resources and power, but the status quo is what maintains their resources and power. And I don’t feel I owe a job to someone whose job harms me and my family. I think both locally and nationally, the people promoting an end to MTR are pretty sensitive to the plight of the miner who may face unemployment from his/her $80,000 a year job until he/she changes careers. Many of us can empathize with that plight because we’ve been in the same situation (not $80K, but being laid off). I haven’t seen any sensitivity from the pro-MTR business people, politicians, reporters, etc. toward the people whose health, homes, and communities are being damaged by MTR. Few if any of those business people, politicians, etc. can empathize with us, because they’ve never had the blasting dust clouds, contaminated water, etc. There are two issues (more, but I’ll stick with these two) regarding MTR that get debated, and those issues are lives and livelihoods. The two subjects should not be spoken of together in the same debate, and they should not be treated as having equal weight. Thanks for your comment. You won’t get any argument from me about the way the political leadership in the region has handled the issue. But to me, the maddening thing about all of the debate and discussions is the refusal of everybody on both sides to simply listen to someone who has different views — listen, and then not respond by saying, “Well, yeah, BUT” and then repeat their own soundbites. I hear men who work on mountaintop removal mines say, “Well, sure, we shouldn’t harm our neighbors … BUT,” and then explain why they need a job, etc. Anybody who truly believes that the national political forces who either oppose mountaintop removal or are lobbying to protect the coal industry are really going to do whatever it takes to help ensure a good future for the kids of Mingo County, WV, isn’t much of a student of history. 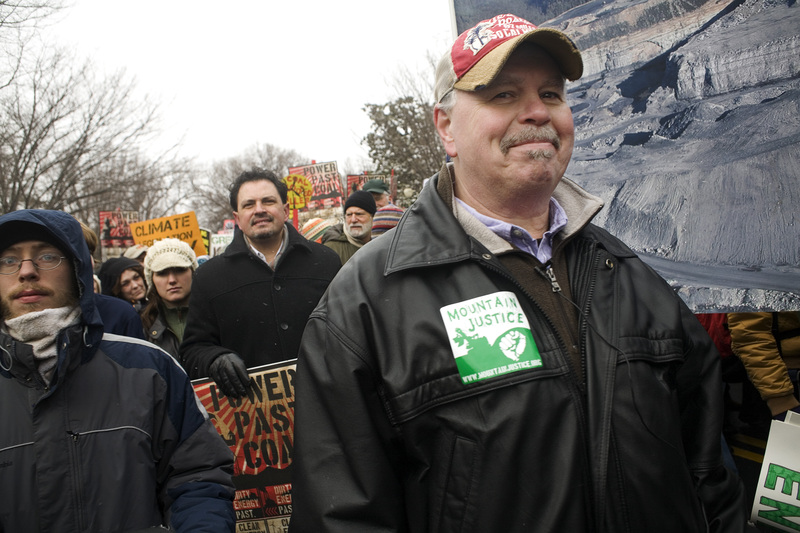 Folks in the coalfields — mine workers, citizens, everybody — are all in this together. It may not be the only answer, but one place to start finding solutions is for one person — just one person — one one side to say to someone on the other side: Tell me why you feel the way you do about this. And just sit and listen, without trying to respond or disagree or make their own point. After covering this issue since 1997, I have yet to find one person who feels strongly on either side who is willing or able to do that. Everybody is more interested in making sure that their soundbites make it into the comments sections of blogs. Your reporting and blogging have brought light to this topic since you were a reporter for the DA at WVU. Ever since that time, I am one who counts you among my heroes. Thanks for the review of a film I have been waiting to see. Now, can you help get this film shown in Morgantown? We need to be able to see it without driving to Charleston. Thanks for all you do to make a difference! In the coalfields, one “side” (strongly against MTR) is a local minority with zero local power, but strong backing from larger and fairly well-funded, moderately powerful, outside forces that see an opportunity in the MTR issue to weaken a crucial national political opponent — the fossil fuel industry. The other “side” (strongly-pro-MTR) is also a local minority, albeit a larger one, has lots of local power, and is helping make a huge amount of money for wealthy and quite powerful outside forces who don’t want to lose that money. On both sides (and in the middle) are a lot of good people. As usual in the case of most issues in the coalfields, the role of “outside interests” turns out to be important. Public opinion surveys generally show most West Virginians oppose mountaintop removal. My take is that there is a vocal number of people whose lives are focused on opposing the practice, and a vocal number of people whose lives are focused on defending it. In the middle are the vast majority of West Virginians, who don’t like mountaintop removal, but aren’t convinced that shutting off the practice without some long-term strategy for economic development is a good idea. One thing that many times is rarely mentioned in discussing the coal industry in WV is the fact that it simply doesn’t employ that many people any more. In fact, more people work in hospitals alone (nevermind the entire health care sector) in WV than mine coal. The coal = jobs argument fails to compute in this day and age. Thanks folks for all the comments … I think this thread has run its course. See you next week. Ken.